We are an independent supplementary school which runs from The Mount Stewart Schools premises on the weekends and during the school holidays. The Olivier School offers outstanding courses for children aged between 3 -11 years old. We supplement a child’s primary education through carefully constructed programmes delivered by highly experienced and qualified teachers. We have extensive knowledge of the state and independent school curriculum and our teaching team boasts impressive credentials, helping children get into the top sets at school or obtain entry into some of the most competitive and selective schools in the UK, including scholarships, at Haberdashers’ Aske’s, Henrietta Barnet, North London Collegiate, QE Boys, St Pauls, and Westminster School, to name but a few. Children are enrolled for either Saturday or Sunday 10am-2pm, term time. We also run a Summer School for 3 weeks over the school break. All classes are fun and lively, aiming to get the full engagement of the child and optimum levels of learning across the day. 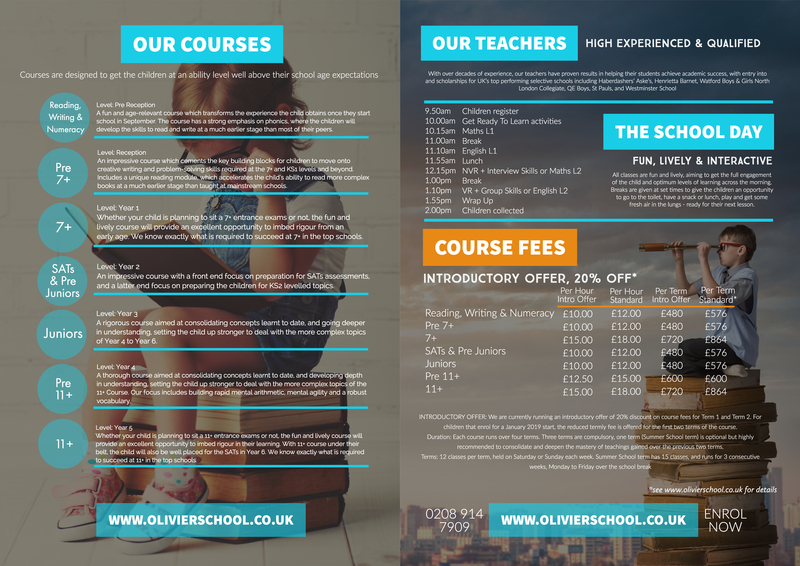 Enrolment is open on www.olivierschool.co.uk. There are very limited places on each course and it is advised that parents book early to avoid disappointment.